The Deepwood Dancers are a group of 8 ladies and gentlemen, aged 16 to 61 who love to perform and make others happy through dance. While each of the 8 may be diagnosed with a developmental or cognitive disability, not one of them lets this hold them back from achieving whatever they set their minds to. With no professional training, they started dancing as part of a recreation activity supported by Lake County Special Olympics. 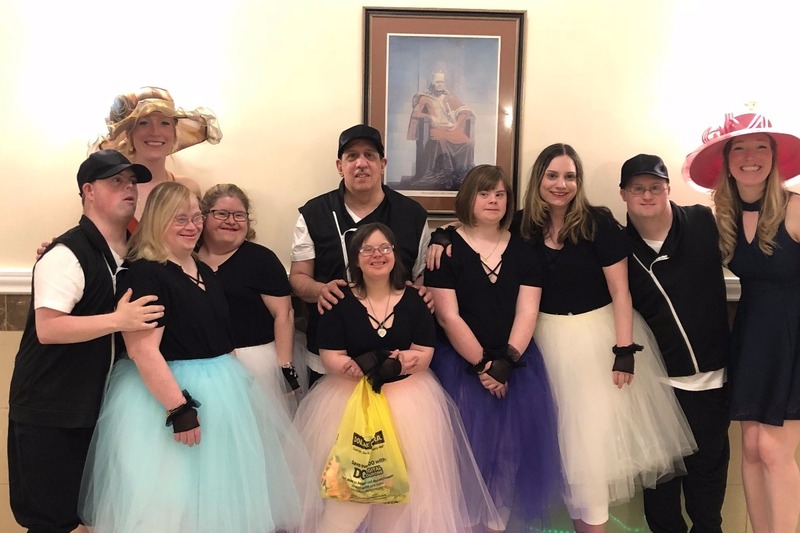 The Dancers soon gained the attention of their community and have performed at a variety of local events around northeast Ohio to raise awareness for those with special needs. With some of the group having participated in the 2017 Special Olympics World Games in Austria, they always had their sights set on competing again. After submitting an audition video, the Deepwood Dancers waited anxiously for two months to find out if they would be invited to travel to Abu Dhabi in the United Arab Emirates this March to compete in the 2019 Special Olympics World Games. To their good fortune, their wish came true! The Dancers received word that they had been selected to participate in the Games just before Christmas, leaving little time to fundraise and prepare. As you can imagine, preparing for such an event in such a short amount of time is a daunting task. Traveling across the world can be quite expensive for one or two people; multiply that by 8 and add chaperones to the mix and you have what may seem like an impossible task. This trip will be funded 100% through donations. Please consider donating to help offset the cost of this trip and help The Deepwood Dancers achieve their dream of going to the Special Olympics World Games in Abu Dhabi to represent Lake County, Ohio and all those who love to dance! Camryn Byrne loves to dance because it is fun, and she likes being with her friends. Camryn likes school, reading, listening to music, theatre, swimming, being with her family and friends, and of course DANCING!! Camryn is a girl through and through with her favorite colors being pink and purple. She likes pizza, pancakes, ice cream, and chocolate chip cookies. Her favorite song to dance to is “Can’t Stop the Feeling” by Justin Timberlake. When asked what Special Olympics means to her Cameron said, “It means that I get to be with the people that are like me, and I get to have fun and make new friends.” In traveling to Abu Dhabi for the Games, Camryn hopes to see the beautiful city and watch other events in the Games. Anthony (Tony) Cervella is the patriarch of the group. Tony likes to dance with his girlfriend Kathy and has made many friends since he started dancing. You name a sport and Tony loves it--especially bowling. He likes dancing to a good beat and loves pizza. Tony said Special Olympics is fun, competitive and time spent with his peers and friends. He hopes that when he goes to Abu Dhabi, he gets to see a camel! Lani Engel knew she wanted to dance at a young age when her family could not get her to stop twirling. Lani has a lot of hobbies that keep her active and busy including playing volleyball, softball, and bowling, and playing video games. She enjoys spending time with her family and friends, doing crafts and watching the Hallmark Channel. Lani likes to eat lasagna and cookie dough, and her favorite color is purple. When it comes to music Lani has eclectic taste ranging from “I Want it That Way” by the Backstreet Boys to “Together Again” by Janet Jackson. To Lani, Special Olympics means taking a special trip to meet new people and represent her country for the world. Much like Tony, Lani thinks she’ll see a camel in Abu Dhabi. Kathy Habat is a ball of energy that loves to dance because she can spend time with her friends and have fun. Kathy is a girly girl that loves to have her nails painted and likes the color pink. In her free time Kathy enjoys listening to music and watching TV shows like The Three Stooges. Kathy’s favorite song is “Thunder” by The Imagine Dragons. Her favorite food is spaghetti. To Kathy, Special Olympics means getting to see other athletes. Since she’s a mini powerhouse on the volleyball court, Kathy hopes to catch a volleyball game while in Abu Dhabi. Kelleen (Kelly) Kinnaird likes dancing because it is good exercise. Kelly also likes it because it makes her happy and is something that she can do with her friends. When not with the Deepwood Dancers, Kelly likes to do Zumba, yoga, likes to cook and also to bowl. Kelly is a foodie that enjoys hamburgers and fries, fish and different salads. Kelly loves to be pampered, get her nails done and the colors pink and purple. When asked about Special Olympics Kelly said, “Special Olympics allows me to be with my friends, to exercise, and to have fun with all of the experiences.” When in Abu Dhabi Kelly wants to experience the different culture, including the different food and dancing. She also wants to swim in the ocean! Sheryl Kintop likes to dance to stay active and to see her friends. Sheryl likes working and spending time with her family. She is involved in many sports and activities including bowling, dancing, volleyball, basketball, softball, and floor hockey. Sheryl likes all things sparkly and singing karaoke with her boyfriend. Sherly likes to dance to a number of songs including “Better When I’m Dancing,” “Feel it Still,” “Can’t Stop the Feeling,” and “Shake it Off.” Special Olympics means having fun with her friends and teammates to Sheryl. Sheryl would like to bring home a medal from Abu Dhabi and just can’t wait to go! Charles (Charlie) Schulz, Jr. likes to dance because he loves music. He said when he dances it makes people happy, which also makes him happy Charlie works three jobs and in his free time likes to watch professional wrestling, sports, and to listen to a wide range of music. He is an uncle to 9 and loves spending time with his close-knit family. He has a jam-packed social life participating in both the Lake Metroparks Special Olympics/Adapted Program and Deepwood Special Olympics programs. Charlie is a meatetarian who loves anything with bacon on it. Songs like “Party in the USA” and “Feel it Still” really get him moving. To Charlie, Special Olympics means being able to compete in sports with people just like him. When in Abu Dhabi, Charlie really hopes to come across a camel or two! Michael (Mike) Sukalac is a returning Special Olympics dancer that likes to move! He says that dancing makes him happy and proud. Mike’s hobbies and interests including playing basketball, bowling, walking for exercise, and participating in Jazzercize. Mike also likes to listen and dance to a variety of music, but especially the “Electric Slide.” Mike’s favorite color is blue, and his favorite food is pasta. Special Olympics means having fun and meeting new people to Mike. In Abu Dhabi Mike hopes to experience a different culture and language. He wants to see how the people of Abu Dhabi live and how it is different from how we live here. We are overwhelmed by the support we have received for the Dancers! Thank you again to all of you who are making this trip possible. Although we have not hit the GoFundMe goal here, we have far surpassed the overall goal for fundraising. As a result we will be making the GFM suspended for donations moving forward. The page will remain up so that we can update all of you on our travels and post videos of our trip of a lifetime!! Thank you, thank you, thank you all so very much for the outpouring of love and support for the dancers! The response even in the last 24 hours to the campaign has been incredibly overwhelming for all of the dancers and their families. The dancers have been practicing like crazy to prepare for this once in a lifetime opportunity. They have been busy performing at the Rotary, being interviewed by Fox8, and performing at their fundraiser this past weekend. We could not be more proud of them and their hard work! A note about the campaign: The funds will be evenly distributed to all of the Deepwood Dancers, one of which is my brother Charlie Schulz. The funds will go directly to me first, and then will be transferred immediately to the team to offset the cost of traveling.